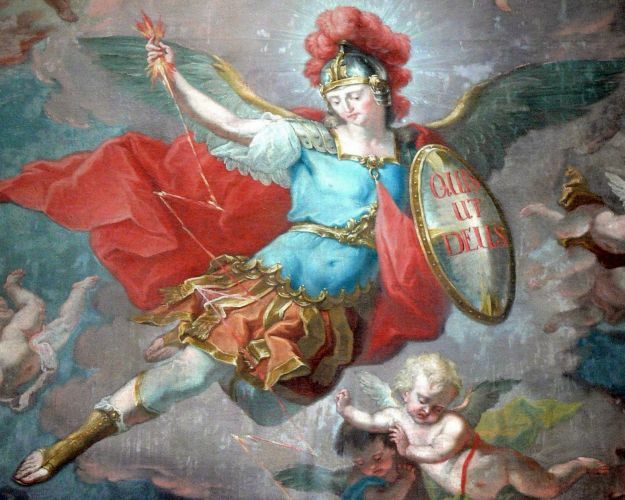 There are seven Archangels in all, but only the three mentioned in Sacred Scripture are commemorated liturgically; St. Gabriel's Feast is on 24 March, and St. Raphael's Feast is on 24 October (the Guardian Angels are remembered on 2 October. The other archangels, whom we know from the Book of Enoch, are Uriel, Raguel, Sariel, and Jeramiel.) Today, though, we honor St. Michael the Archangel, whose very name in Hebrew means, "Who is Like God" ("Quis ut Deus" in Latin). He received the souls of saints and brought them into the paradise of exultation and joy. He was prince of the synagogue of the Jews, but now he is established of our Lord, prince of the church of Jesu Christ. And as it is said, he made the plagues of Egypt, he departed and divided the Red Sea, he led the people of Israel by the desert and set them in the land of promission, he is had among the company of holy angels as bannerer. And bearing the sign of our Lord, he shall slay by the commandment of God, right puissantly, Antichrist that shall be in the Mount of Olivet. And dead men shall arise at the voice of this same archangel. And he shall show at the day of judgment the Cross, the spear, the nails and the crown of thorns of Jesu Christ. The fourth victory is that the archangel Michael shall have of Antichrist when he shall slay him. Then Michael, the great prince, shall arise, as it is said Danielis xii. : “He shall arise for them that be chosen as a helper and a protector, and shall strongly stand against Antichrist.” And after, as the Gloss saith: “Antichrist shall feign him to be dead, and shall hide him three days,” and after, he shall appear saying that he is risen from death to life, and the devils shall bear him by art magic, and shall mount up into the air, and all the people shall marvel and worship him. And at the last he shall mount up on the Mount of Olivet, and when he shall be in a pavilion, in his siege [seat], entered into that place where our Lord ascended, Michael shall come and shall slay him. Of which victory is understood, after St. Gregory, that which is said in the Apocalypse. The battle is made in heaven. This word of the treble battle in heaven is expounded of the battle that he had with Lucifer when he expulsed him out of heaven, and of the battle that he had with the devils that torment us. St. Michael the Archangel, defend us in battle; be our safeguard against the wickedness and snares of the Devil. May God rebuke him, we humbly pray, and do Thou, O Prince of the Heavenly Host, by the power of God, cast into Hell, Satan and all the other evil spirits, who wander throughout the world, seeking the ruin of souls. Amen. This great champion of Israel has made many important appearances throughout the years. In A.D. 590, during the reign of Pope Gregory, a great pestilence swept through Rome. During a procession and litanies led by the Holy Father there, St. Michael appeared over the Castel Sant'Angelo -- a building which was formerly Hadrian's tomb, but which was converted to papal use, connected to the Vatican by a long tunnel. A statue of St. Michael sits atop the building today (picture at top right). Mont St. Michel was built to St. Michael's honor off the coast of Normandy, France because our warrior Saint is said to have appeared there in 708 to St. Aubert, Bishop of Avranches. St. Michael also, along with SS. Margaret and Catherine, appeared to St. Joan of Arc (d. 1431) when she was thirteen years old, encouraging her to assist Charles VII in defeating the English. She later told her judges, "I saw them with these very eyes, as well as I see you." St. Michael is patron of knights, policemen, soldiers, paramedics, ambulance drivers, etc., and also danger at sea, for the sick, and of a holy death. He is usually depicted in art carrying a sword and/or shield, battling Satan. (The Feast of SS. Simon and Jude is 28 October) An old custom surrounds Michaelmas Daisies; one plucks off the petals one by one thus: pull a petal while saying ""S/he loves me," then pull of the next while saying "S/he loves me not," and repeat until all petals are gone. The words one intones while pulling off the last petal lets one know if one's love is requited. As to foods, geese were, at least at one time, plentiful during this time of year, so roast goose dinners are traditional (eating them on this day is said to protect against financial hardship, according to Irish and English folk belief). It was also the time (at least in Ireland) when the fishing season ended, the hunting season began, and apples were harvested, so eating apples today with that goose would be a nice touch. Position rack in bottom third of oven and preheat to 350�F. Rinse goose inside and out; pat dry with paper towels. Sprinkle inside and out with salt and pepper. Using knife, cut small slits all over goose; place garlic slices into slits. Place goose on rack, breast side down, in large roasting pan. Roast goose 2 hours 45 minutes, basting occasionally with drippings and removing excess fat; reserve 6 tablespoons fat. Turn goose over. Roast until brown and thermometer inserted into thickest part of thigh registers 175�F, basting occasionally with drippings, about 45 minutes longer. Meanwhile, toss apples and lemon juice in large bowl. Pour 6 tablespoons goose fat into 15 x 10 x 2-inch glass baking dish. Using slotted spoon, transfer apples to baking dish; toss apples in goose fat. Add sugar, Calvados and cinnamon to apples; toss. Bake apples alongside goose until very tender and golden, about 1 hour. Serve goose with caramelized apples and a Bordeaux wine. Peel an apple (Granny Smith or Golden Delicious apples work well), cutting away any bruises (some people say to core the apple, others say not to. Experiment for yourself). Carve as life-like a face as possible into the apple (don't cut too deeply so as to avoid rotting). Don't forget the little things that make a face so human -- the little lines running from nose to mouth, the hollows of the eyes, the depressions caused by cheekbones, etc. Depending on the "skin" tone desired, soak the carved apple for about 45 minutes in a mixture of lemon juice (or cider vinegar) and water (the longer you soak, the lighter the "skin" tone will be). Hang the apple up in the dryest, darkest room of your home. Come back in 3 to 4 weeks to see what you have! (Hallowe'en would be perfect time for the unveiling!) It should have shrunk by about two thirds its original size, darkened some, and show the wizened features of an old woman or man. When thoroughly dry, decorate using very diluted food colorings for rouge; corn silk, cotton, or yarn for hair; cloves or food colorings for eyes; fabric triangles for scarves, etc. Secure onto a "body" made of a bottle, styrofoam cone, wooden dowel, etc., and make clothes as desired. For the Irish, the next food du jour is St. Michael's Bannock, a scone-like bread, cooked in a frying pan. Mix the barley flour, oat meal, and rye meal. Add flour and salt. Mix the soda and buttermilk (start with the 2 1/2 C) and then add to the dry mixture. Stir in honey. Turn out onto floured board and mix (as with all breads, don't over-mix), adding more buttermilk if too dry, or more flour if too sticky). Divide dough in half, and roll each, on a floured board, into an 8" circle (about 1/2 inch to 3/4 inch thick). While heating a lightly greased skillet, mix the eggs, cream, and melted butter. Spread onto one of the bannocks and place the bannock, egg-side down, in the skillet and cook til the egg-side is browned. Put the egg mixture on the top side, flip the bannock and cook 'til the second side is golden. Repeat this application of the egg wash and flipping and cooking until each side has been cooked three times. Do the same with the second bannock. Serve warm with butter and honey. According to an old Irish folk tale, blackberries were supposed to have been harvested and used up by this date, too, since it is told to children that when Satan was kicked out of Heaven, he landed in a bramble patch -- and returns each year to curse and spit on the fruits of the plant he landed on, rendering them inedible thereafter. So a dessert with blackberries would be perfect. Put blackberries in a 1-quart baking dish with half of the sugar. Sprinkle with lemon juice. Cream butter, remaining sugar, flour, and salt together; sprinkle over berries. Bake at 350� for 40 minutes. Serve warm or cold with cream, ice cream, or dessert sauce. On September 29, Saint Michael's Day, the city of Augsburg holds an annual autumn fair to which hundreds of peasants from far and near come for trade and pleasure. Chief among the day's attractions is the hourly appearance of figures representing the Archangel and the Devil. The figures are built in the foundation of Perlach Turm, or Tower, called Tura in local dialect. This slender structure, which rises to a height of two-hundred-and-twenty-five-feet and stands next to the Peter's Kirche, north of the Rathaus, originally was a watch tower. In 1615 the watch tower was heightened and converted into a belfry. Almost a hundred years earlier the group depicting the saint and the devil had been installed in the tower's understructure. Annually on his feast day the archangel's armor-clad figure, holding a pointed spear, appeared whenever the tower bell struck, and stabbed at the devil writhing at his feet. During World War II the historic figures--the delight of generations of fair-goers--were destroyed. Since then a new group has been made and installed. Today, as for over four centuries, spectators continue to gather about the Tura and to watch breathlessly the symbolic drama of Michael, head of the Church Triumphant, dealing death blows to the dragon which brings evil and destruction to the world of men. Note: "Michaelmas" is pronounced "MICKel-mus." Today is also one of the 4 English "Quarter Days," days which fall around the Equinoxes or Solstices and mark the beginnings of new natural seasons (i.e., Spring, Summer, Winter, Fall) and which were used in medieval times to mark "quarters" for legal purposes, such as settling debts. The other days like this are: Lady Day (the Feast of the Annunciation) on March 25, the Feast of St. John on June 24, and Christmas on December 25.